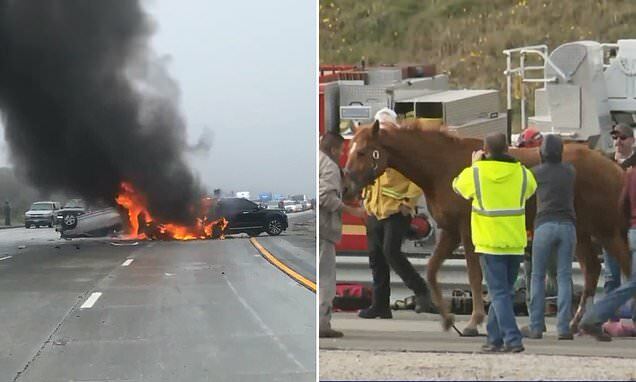 A multi-vehicle pile-up along two areas of a freeway left more than 30 people injured including a baby in critical condition and killed a horse traveling in a trailer. The massive accident happened around 2.45pm involving approximately 50 vehicles in two locations along The Grapevine section of Interstate 5 near Gorman, California, according to KTLA . Los Angeles County Fire Capt. Ron Haralson said a dozen people were transported to the hospital. A critically injured 21-month-old child had to be airlifted from the scene, while four other people were taken to hospital, and 29 more suffered minor injuries. A horse caught in the chain reaction crash was not so lucky after a large truck smashed into the rear of the trailer that it was traveling in.